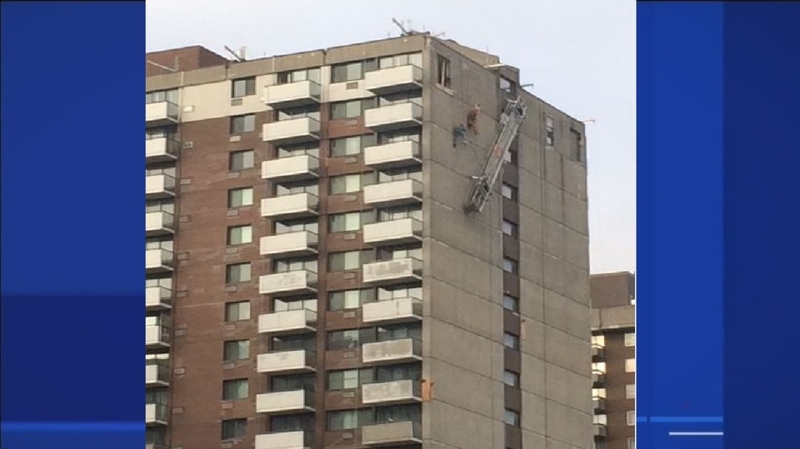 A dramatic rescue operation took place in Cote St-Luc Thursday as two people were left hanging from a scaffold that partially collapsed on a 23-storey building. The workers were 17 floors above ground when it happened. The Montreal fire department's specialized rescue team - known as the 'Spider-man unit' - was dispatched to the site, near the corner of Cavendish Blvd. and Kildare Rd., at 8:15 a.m. The scaffolding was unhooked on one side, leaving the platform dangling at a dangerous incline. The two workers were left suspended by only wires and harnesses while awaiting emergency responders. Scaling the side of the building in harnesses, the firefighters were able to retrieve and guide the workers through an open window. 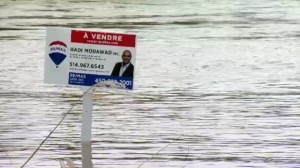 Officers with the Montreal police remained on the ground to supervise. The rescue operation took about 45 minutes in all, and the men were rescued without injury. 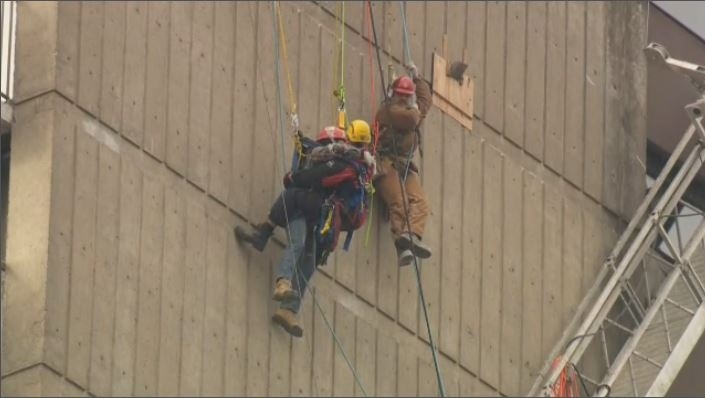 “They spent at least 45 minutes dangling there on the 17th storey in these very uncomfortable harnesses,” said Chief of Operations, David Shelton. The Spider-Man team trains by rappelling down Place Ville-Marie, and is prepared for just such an emergency. “This is what we practice for. This is what we live for. I can't tell you how many hours are invested in preparation for exactly this kind of event and our equipment is more robust and in some ways more comfortable. It's made for working in under these conditions and so that's how we deal with it,” said Shelton. The Commission for Standards, Equity, Health, and Safety (CNESST) will investigate the cause of the accident.